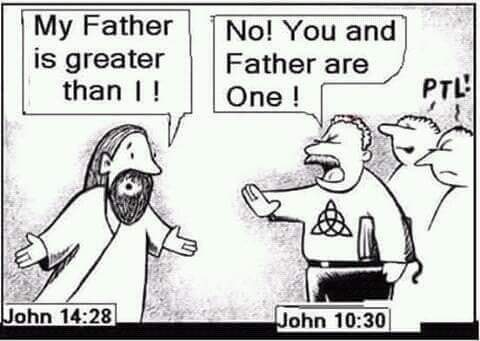 JESUS IS NOT GOD! Well, he is the god of many ignorant Christians, just as the idols Mary, St. Isidore, St. Clarus, St. Bavo, St. Francis, St. Thomas Aquinas, Guadalupe and all of the other man appointed “Saints” (false gods) that are worshiped by the Catholic’s. They even worship the angels Michael and Gabriel referring to them as “saints,” but there is only ONE GOD, the MASTER OF THE UNIVERSE, The CAUSE OF ALL EXISTENCE. He is the God of the Hebrews, the Creator of all mankind and not some fabricated, man-made god of the Gentiles. He is the God who told the Hebrews Himself, “I am God, your Lord” and “You shall have no other gods.” GOD IS ONE, He is NOT three different entities, He is God ALONE, and is PERFECT in His ONENESS. He is not two or more, but one, unified in a manner which surpasses any unity that is found in this world- God’s unity is absolute and anyone who does not believe in God’s oneness does not have a portion in the world to come, the world that is governed by the One true God where He alone is praised and worshiped- not Jesus. THERE IS ONLY ONE GOD, and His name is NOT Jesus; JESUS IS NOT GOD. Some contradictions in the New Testament are due to human error in translation, other contradictions are due to DELIBERATE LIES in efforts to fool Christians into worshiping a false god instead of the God of the Jewish people. Most confusion is due to our ignorance of the Hebrew tradition. When Yahuashua ben David [aka Jesus] who was a Hebrew Rabbi walked on the earth HE WAS NEVER CALLED JESUS! And his name translated to English is Joshua not Jesus, and he NEVER CALLED HIMSELF GOD!!!! Study more and learn where this “Jesus” really came from. You can start by reading DECEPTION THROUGH THE NAME “JESUS CHRIST” part 1, through 6. And read this regarding the history of Christianity. God said as recorded in Isaiah 40:25 “To whom can you liken Me, with whom I will be equal.” THIS INCLUDES JESUS! Deuteronomy 6:13 says “Fear God, your Lord, and Deuteronomy 6:5 says “And you shall love God, your Lord”- these two verses have absolutely nothing to do with worshiping Jesus and calling him God. Was David confused when he said (Psalms 42:3) “My soul thirsts for the Lord, for the living God”, was he referring to Jesus? No! When you pray to Jesus YOU’RE PRAYING TO AN IDOL,which makes false prophets idol worshipers. Our prayers and supplications should be directed to God, He is our Master, our Creator and He alone is worthy to be praised! When Yahuashua walked upon the earth, he pointed people to God, not to himself. Yahuashua knew that he wasn’t God, he never called himself God and he never tried to make people believe that he was God. It was the fake Christian idolaters whose hatred for the God of the Hebrews was so vehement that they created “Jesus” as their god, a replacement for the real God (the God of the Jews) who they believed to be unjust, mean and cruel. The angels who communicate to real, authentic prophets and are perceived by them in prophetic visions know God the Creator with very immense knowledge- they know that Jesus is not God so there’s no way that a genuine prophet of God would ascribe to anyone as God or “Master” except for God Himself. Not everyone who performs signs or wonders should be accepted as a prophet. Only a person who is known to be fit for prophecy (If he follows the paths of prophecy in holiness, separating himself from worldly matters) and afterwards performs a sign or wonder and states that he was sent by God it is good to listen to him [Deuteronomy 18:15] states, “Listen to him”. It is also possible that a person will perform a sign or wonder even though he is not a prophet – rather, the wonder will have another cause behind it [fallen angels, sorcery, black magic, demons, etc], but even if such a sign or wonder should come, you should not listen to the words of that prophet [Deuteronomy 13;3-4]. 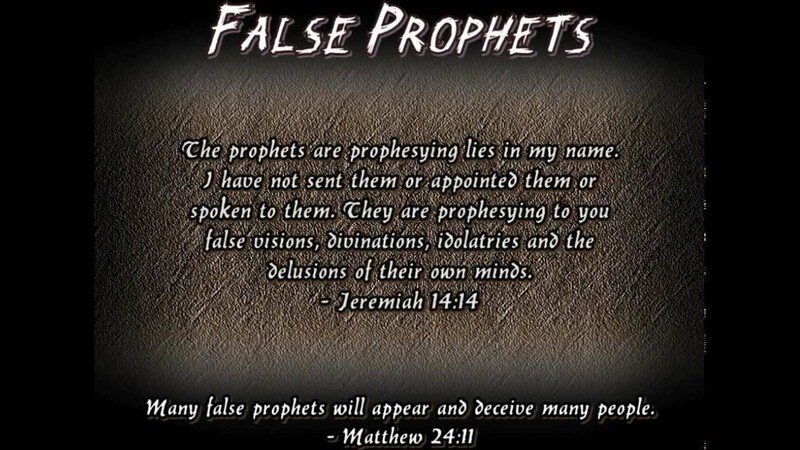 How False Prophets Get Their Power-REVEALED! Part 1 and parts 2 and 3 are good reads concerning false prophets. In conclusion, a prophets function is to make us consciously aware of our obligations to God, not to entertain us by predicting if a movie star will become pregnant or who will win the next basketball game or boxing match- magicians do that! If the prophet is not absolutely holy, separated from worldly attractions, and is not leading the people to absolute holiness and not warning them of their sinful lifestyles- HE/SHE WAS NOT SENT BY THE GOD OF THE JEWS! Keep these articles coming sir/madam, these messages are not taught in church and there is a generation of people who want to know and need to know this truth. Blessings to the author. Wow this is heresy from the pit of hell itself. Jesus is God from Genesis to Revelation it’s all about Him. God is not a name it’s a title and the God of the Jewish people is Jesus they don’t understand it but soon and very soon that veil will be removed from their eyes when Christ comes back. John 1-3 “All things were made by Him; and without Him was not any thing made that was made” . Denying Christ’s Deity is rejecting salvation and that’s the spirit of the Antichrist (1 John 4:3). Muslims and other religious cults reject Jesus as God that’s why today they’re dying and go to hell. Jesus made it very clear I AM THE WAY THE TRUTH AND THE LIFE NO MEN COMES TO THE FATHER EXCEPT BY ME (John 14:6 ) Jesus is the bread of life He is the ONLY source of life and without HIM there is no life (1 John 5:12)” He who has the Son has life; he who does not have the Son of God does not have life.”. Please don’t allow the devil to deceive you you’ll regret it because hell is real. ” Every spirit that confessed not that Jesus Christ is come in the flesh is not of God: and this is that spirit of Antichrist, whereof ye have heard that it should come; and even now already is it in the world.Jesus is the very same God mentioned throughout scripture as the God of Abraham Isaac and Jacob the I am Isaiah 9:6 called Him the Everlasting Father. The wise men from the East came and worshipped Him (John 2;1-2) Thomas called Him my Lord and my God ref:John 20:28. Jesus referred to Himself as the I AM and the Jews knew exactly what He meant and accused Him of blasphemy and having a demon. Jesus went further and said Abraham rejoiced when He saw His day (John 8:56) and the Jews were enraged by His statement.If He wasn’t God how did He saw Satan’s fall from heaven in Luke 10:18 and why did He say He is the Alpha and the Omega in revelation 22:13. No human being ever did what Jesus did, died and rose from the dead and went into the city and ate fish with His disciples “When He had said this, He showed them His hands and His feet. But while they still did not believe for joy, and marvelled, He said to them, “Have you any food here?” So they gave Him a piece of a broiled fish and some honeycomb. And He took it and ate in their presence.” (Luke 24:40-43). (1). “And this is life eternal, that they might know YOU “THE ONLY TRUE GOD,”and Jesus Christ, whom you hast sent. (JOHN17:3). (5). However, no one knows the day or hour when these things will happen, not even the angels in heaven or the Son himself. Only THE FATHER knows. Appreciating the persistence you put into your website and in depth information you offer. It’s awesome to come across a blog every once in a while that isn’t the same outdated rehashed material. Wonderful read! I’ve bookmarked your site and I’m adding your RSS feeds to my Google account. I can’t wait for you to write more on this topic. Don’t expect many Christians to agree, they’ve been brainwashed a long time ago and are now brain dead! This is nothing but the truth! I pray that the eyes of the TRUTH SEEKERS open and turn to God while they run out from religion!